Let's Get Out Of Here! : A-Z Challenge 2013: B is for Bela Lugosi! B is for Bela Lugosi! His most famous role - Count Dracula. Bela is truly one of my favorite actors. I wanted to include him in this challenge - but this will be a pretty light look at the man - there are whole books written about him and his life - we'll just dip in for the big picture, and some interesting highlights. 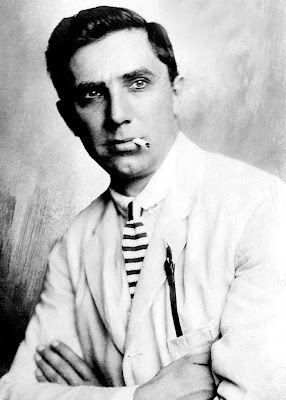 Born October 22, 1882 in Lugos, Hungary. Died August 16, 1956 in Los Angeles, California. Was member number 28 of the Screen Actors Guild. An early acting promo photo. He started acting on stage in his native Hungary. He became a huge star, with one of his most popular roles playing Jesus Christ. He once was quoted as saying "In Hungary acting is a career for which one fits himself as earnestly and studiously as one studies for a degree in medicine, law or philosophy. In Hungary, acting is a profession." Bela Lugosi was the first celebrity to come out to the press as a drug addict - he'd become addicted to morphine in the 1930's. "Methadone treatment, with its heinous side-effects, was virtually unknown throughout most of the world until the 1960s; but it had been developed in England during the late thirties, and something was known there of its effect in treating addiction. 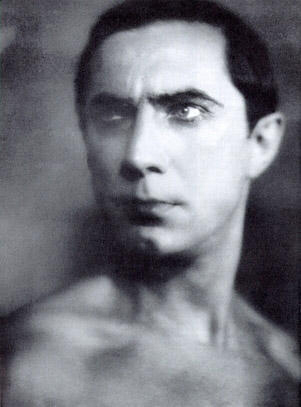 Bela had journeyed to England in 1938, anxious for a methadone cure. He later said, "I smuggled a box of it back. I guess I bought a pound." Treating himself under methadone in the privacy of his home, Lugosi eventually realized to his despair that he had traded one drug problem for another. He said "I didn't eat. I got sicker and sicker." From Heroes of the Horrors, by Calvin Beck. Page 101. MacMillan Publishing, 1975. Giving his all in Ed Wood's Bride of the Monster in 1955. Late in life Bela was befriended by Ed Wood, Jr. - the infamous director of Plan 9 from Outer Space. 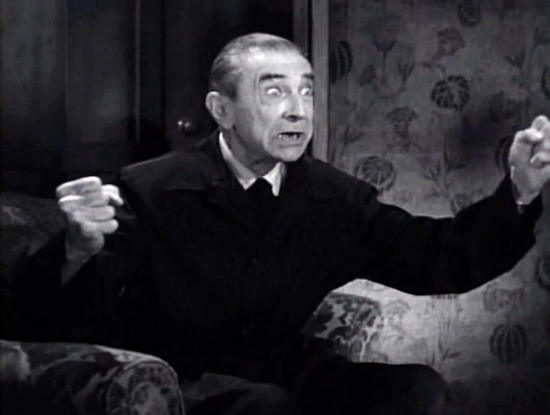 Ed cast Bela in three movies - but Bela was only alive to work in two of them - Glen or Glenda? and Bride of the Monster. For Plan 9, Ed planned to have Bela star as The Ghoul Man - a resurrected corpse working for space aliens out to take over the Earth. Sadly, Bela died during production in 1956 after only a couple of minutes of footage had been shot. 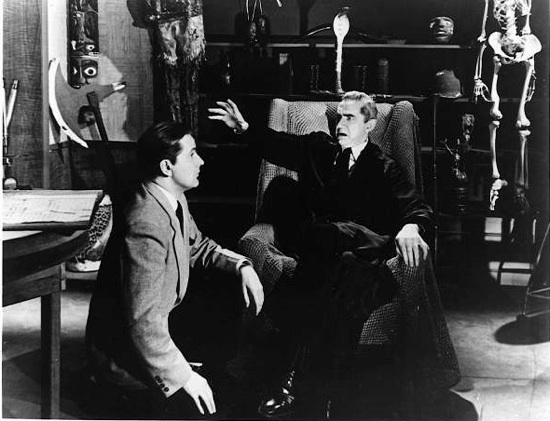 Three years later Wood had secured the funds to finish the movie - and did - using all of the footage of Bela, then substituting his wife's chiropractor as a very unconvincing double. Ed Wood and Bela on the set of Glen or Glenda?. It was a sad end to a career that never reached the heights it seemed it should have. Thankfully, a couple of generations of Monster Kids have helped Bela Lugosi's memory stay alive. Until you can "C" the next post you Can Poke Me With A Fork, Cause I Am Outta Here! Bela was incredible and I loved Martin Landau playing him in Ed Wood. He truly gave us some very memorable work. I really love those old pics of him you found. Landau deserved that Oscar - he embodied Bela so well! Lugosi rocks! Bela was incredible. I think the Golden Era screen stars have a charisma that's gone unmatched. Was it the serious study they gave to the craft, the cinematography, or simply the light of extraordinary souls shining through the screen that made them what they were? I don't know. But I do know we'll never see their like again. He was indeed. There's something about the sheer amount of light they had to capture to get the images on the film that seems to have brought out their inner light - and you're right - we won't see their like again. Ed Wood was a great tribute to Lugosi - I'm pleased you enjoy his work too. Did you ever give away that print you posted about back around Halloween? It was sooo cool! Some of today's stars could take a cue from Bela and treat their profession as Bela did, dedicating themselves to their art as a doctor or lawyer would to theirs. Instead, some rely on their looks and treat their careers as if it were Carte Blanche to behave badly or usr their exposure to advance a political agenda. You are quite right. It's sad he fell into the poverty row filmmaking like Monogram and PRC in the 40's. His last studio film was Abbott and Costello Meet Frankenstein in 1948. 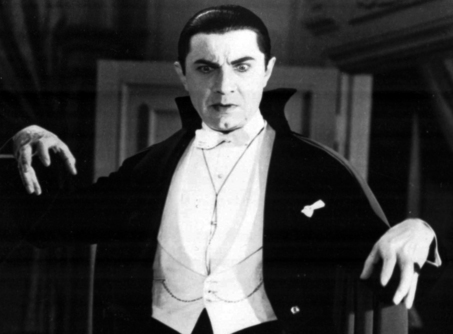 He played Dracula on film for only the second time (in a feature) - and pulled it off well at the age of 67 (!). I wish the 50's had gone better for him. 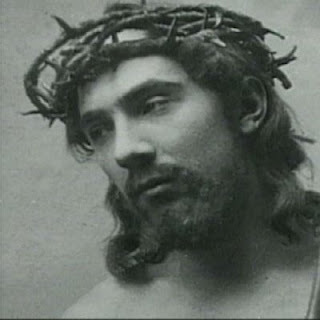 Fascinating post...I had no idea Bela played Jesus or that he was such a good-looking matinee idol! How sad about his drug addiction...I've read that many famous people were involved in drugs at that time, notably famous jazz performers like Billie Holiday and Charlie Parker. You know what boggles me - when he broke through as Dracula in 1931? He was almost 50 (!) years old! So there was a lot of his youth not captured on movie film - which is another sad thing. I love that he was best known in his homeland for playing Jesus and best known here for playing Dracula! I had no idea he played Jesus! Great photos. Thanks for stopping by my blog yesterday! You're very welcome! It was a cool site! I'm now a follower of your blog...can't wait to see what other Golden Age performers you bring out for us to enjoy! Thank you so much for following! We're going to run the gamut this month - and not all old timers - some current performers and artists will be getting the LGOOH spotlight! Fantastic actor. Wasn't too fond of "Dracula" but his performaqnce was excellent. Also, nice acting in silly rubbish like "Scared to Death", "Bride of the Monster" or "The Gorilla". He truly was - and you're right - the movie surrounding him was often lackluster at best - but he always made the movie better - just by being in it. Poor Bela. I know a gal who, for many years, traded heroine for methadone - didn't know how awful the side effects of it were, though. Yeah, it worked him over pretty badly. Thanks for coming by. A sad end indeed Craig. I never knew so much about him, but he's still one of my favorite actors. One of mine too, Maurice. Incredible presence and that wonderful voice! Ghoul movies were popular in the 1950's. If only Bela lived to finish the picture. That's an interesting notion - what would have happened if Bela had lived another five or ten years? There might be a novel or movie in that...thanks for coming by! I'm pleased there's room in the Filmmatic Universe for old school monster movies - and Bela was certainly a vital force in those three classics you mentioned! I think he had one of his proudest moments appearing in Ninotchka! Thanks pal!